A couple who completed a World Cup sticker album with their own drawings of players have turned their hands to politics - sketching party leaders ahead of May's election. Dubbed the "Panini Cheapskates", Alex and Sian Pratchett, from Oxford, created all 639 stickers of the World Cup Panini album last year. Mr Pratchett said their latest project was inspired by ITV's Leaders' Debate. He admitted the couple's artistic talents had not improved. He said the debate on 2 April had sparked the couple's latest labour of love and helped to "scratch the itch" left behind following the end of the World Cup. "I can categorically say my drawings have not improved though," Mr Pratchett said. "I sat down to watch the leaders' debate - my wife was away and I was left to my own devices - and I thought to myself 'even though we are still rubbish at this, surely we can draw this lot'. "[Nigel] Farage was first and it's fair to say it went quite badly. 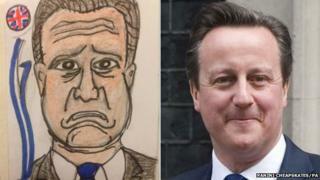 "The second one was supposed to be Cameron but ended up being Miliband, which is quite alarming." Mr Pratchett sketched an image of the prime minister before the end of the debate, but said he "got into trouble" with his wife, having failed to draw any of the women leaders. The pair have since completed Nicola Sturgeon of the Scottish National Party, Plaid Cymru leader Leanne Wood and Green Party leader Natalie Bennett, as well as Lib Dem leader Nick Clegg. On completing Mr Clegg the pair tweeted: "Done a Clegg. Turns out drawing a man with no defining characteristics can be quite the ordeal..."
Mr Pratchett said he was "not the most political person", but would follow the campaign "pretty closely". As well as the leaders, the couple have also drawn other politicians involved in the campaign, including Shadow Chancellor Ed Balls and former Prime Minister Tony Blair. Mr Pratchett said each drawing takes about 20 minutes. "Sian was always a bit quicker though," he admitted.